CHRISTINA OF MARKYATE made a formal vow of virginity at age 14, in about the year 1110. Two years later her family, an upper-class, Anglo-Saxon family in England, forced Christina into a betrothal. She was kept in physical custody for a year, during which an ecclesiastical judge was bribed to set aside her vow of virginity. The marriage took place at last. The resisting bride, however, would not consent to its physical consummation. She spent the night prepared for her deflowering recounting to her husband the story of St. Cecilia—the saint who had convinced her husband, Valerian, to live with her chastely until each could enter a monastery. Christina’s husband had other dreams. The situation was at an impasse. Christina then fled, with the aid of a local hermit. An anchoress named Alfwen hid her for two years. Christina was then moved to a hermitage at Markyate, where some male hermits lived, and they secreted her for four more years. Ultimately her family accepted that her resolve would not weaken. The marriage was dissolved, and Christina became technically free to live a more “normal” religious life. By this time, however, the solitary lifestyle had become established. She became a hermitess, inheriting the site where she had hid for four years. In time a group of disciples formed around her, the hermitage becoming first a group household and ultimately a convent with Christina as abbess. Christina’s story takes us into all the types of religious life of her period. She was in turn a consecrated virgin, a recluse, a hermitess, and a nun. A traditional anchoress figures in her story as well. As her life illustrates, to be a bride of Christ was not necessarily to be a nun. Especially in the later Middle Ages, women pursued the religious life in a variety of forms. Most medieval women married the men their families chose for them or peaceably accepted consignment to the convent, the fate of many upper-class women of the High and Late Middle Ages. Such marriages, whether to men or to Christ, were reasonably successful. To be a bride of Christ was for many women not a denial of the “natural” desire to marry and bear children, but rather the route to a life more independent and intellectually creative than in the marriage of the day. Nuns were regulars, that is, they lived communally under rule (Latin regula) and took the three monastic vows of chastity, poverty, and obedience. They came to the convent, often as children, from the households of the rich and powerful; the shelter of a medieval nunnery was available to the daughters only of those who had the resources to build and endow them. One example was the great Hildegard of Bingen (1098-1179), famed mystic, author, and adviser to popes, kings, and emperors. As a frail child, she was dedicated to the church by her family, minor nobles in Rhineland Germany. At age 8, Hildegard was delivered into the care of a woman named Jutta, the daughter of the regional lord and a hermitess or anchoress. In her youth, Jutta had refused both marriage and the convent. She chose the solitary life and the anchorhold. Her father provided the setting and financial support. But Jutta’s renowned holiness soon brought her not only the young Hildegard as disciple but also others desiring to be associated with her. What had been a cell for a solitary gradually became an irregular (without rule) household for a group. By the time Hildegard was old enough to take vows, the household had been formally constituted as a convent with Jutta as abbess. So it was that Hildegard rode out her career as a nun and later as an abbess. While Hildegard’s religious decision was made for her by her family, and Jutta chose her religious vocation with the support of her family, other women made religious choices in opposition to the voices of their families. They demanded the right to be religious and if necessary connived to achieve it. Women may have been consigned to a nunnery, but never to any of the following professions. These were all lives of choice, lives embraced and desired, often against familial wishes. Occasionally women chose to be hermitesses. In the eleventh and twelfth centuries, some women of religious bent rejected the communal and regulated life of the convent for the desolation and difficulty of a solitary life in the wilderness. Like many men in this period of religious revival, they took to the forests, the deserts, and the bogs. Alone or with a small group of like-minded individuals, they lived in makeshift dwellings and sought a mystical relationship with God. These hermitesses stood largely outside the formal organization of the church, unless they chose to accept the counsel of a caring clergyman. The nunneries of the eleventh and twelfth centuries, and the hermitages that grew in this same period, were aspects of a society almost completely rural. There remained abundant land, yet uncleared, on which a pious noble might found a convent for his daughter; there were forests within which an enterprising hermitess might establish herself. Towns were few, the distances between them long. These religious movements of withdrawal, paradoxically, gradually tamed and eliminated the environment to which they had fled. They cleared the land and provided outposts of civilization, encouraging and aiding the growth of towns and cities. By the thirteenth century western Europe was considerably deforested. The eremitic age was over, and new religious vocations for women emerged. The thirteenth and fourteenth centuries, a more urban age, was the age of beguines and tertiaries. The beguine was merely a religious woman, mulier religiosa. She took temporary vows, usually of chastity and simplicity of life, donned some kind of identifying habit, and dedicated herself to good works. The beguine, a product of the growing cities of thirteenth- and fourteenth-century Europe, worked in those cities, answering the needs of the displaced poor and sick. She was bound to no order. She might live at home or with a group who shared her values. She could later renounce her vows and marry without difficulty. The beguine movement was the only religious current of the Middle Ages that was female in conception. It did not owe its impetus, its main support, or its direction to men. Pressure for the beguine movements (and the tertiary movements) was generated in part by an imbalance in the numbers of men and women of marriageable age. From this pool of unattached women arose more women who wanted to assume religious lives and more women available (because unmarried) to lead them. They awaited only the right stimulus to aid them in focusing their lives religiously. That stimulus emerged in late twelfth-century Belgium, from two women: Ivetta of Huy and Mary of Oignies. Ivetta of Huy (1157-1228) was born to an affluent family near Liege. She was married at 13 and widowed at 18, already the mother of three sons. She resisted the demands of her family to remarry and with the support and encouragement of the Bishop of Liege, she was allowed to take widow’s vows. She gave the care of her children to her father and spent the next ten years using her home as a hostel for pilgrims and travelers and working in a nearby leper colony. Still feeling too much contact with worldly affairs, Ivetta then moved to the leper colony, enclosed herself in a cell, and lived there as an anchoress until her death forty-eight years later, by then famed as a mystic. Mary of Oignies (1177-1213) also was born to wealth in the Brabant region. She was married at 14, against her will. More successful than Christina of Markyate, she was able to convince her husband that they live in continence and share a religious vocation. They worked together caring for lepers. Mary’s reputation spread, and she became the center of a group of women who lived chastely and worked among the sick. In 1207, after about fifteen years of work with the lepers and of exercising a kind of moral leadership over the amorphous community that had grown up around her, she retired to an anchorhold near Oignes. She lived in the cell only six years before dying at the age of 36. Mary and Ivetta both began their religious lives in the world. Though both gradually withdrew from the world, the concept that a religious life could be lived in the world was central to their perception. Poverty was also a tenet of their ideology; the families of these women had to constantly stand guard that they not decimate the family fortune with excessive almsgiving. Combining apostolic poverty and service in the world, they thus shared characteristics of the movements spurred later by St. Francis. From these women the beguines developed. The movement swept through the Low Countries and Germany in the thirteenth century, centered in the cities. The beguine movement accommodated women of more middling status than those who filled the nunneries. The beguines lived in the world, supporting themselves with any manner of honest work and spending the remainder of their time in charitable works. They served the poor and the sick in the urban environment. They banded together, unattached women of the cities, living separately or communally in houses (later called beguinages) built or bought with their own resources. To get a sense of how many there may have been, by the end of the fourteenth century there were about 1,500 beguines living in Cologne, a city whose general population was only about 20,000. Over a two-hundred- year period, on average, perhaps one in ten residents was a beguine. While acknowledging the social and demographic components of the movement, it is important to stress that this was essentially a religious happening, a great outpouring of religious fervor. These women, who stood apart from hierarchy and structure, were degraded by many. The word beguine itself was a smear meaning “heretic.” Yet the movement could not be stopped. It offered women a wide range of charitable employment with a minimum of complication, a self-regulated balance between outreach and contemplative withdrawal, and the freedom to change one’s mind and later marry or assume another religious role. Following upon the success of Francis of Assisi in the early thirteenth century, a number of mendicant communities (those who begged alms for a living) arose. These quickly organized into three orders. First Orders were the friars themselves—groups of wandering male preachers vowed to absolute poverty and complete dependence upon alms. Second Orders were for women in enclosed nunneries who sought to participate in the voluntary poverty of the friars, but in traditional form as nuns vowed to obedience. Third Orders took in laypersons, male and female, married and single, who in some measure identified with the reformist ideals and apostolic fervor of the early followers of Francis. Among these were many women, virgins as well as widows, who took vows (revocable), donned habits, and led religious lives of varying intensity. A tertiary was a member of such a Third Order. One of the most famous tertiaries was Catherine of Siena (1347-1380). The twenty-fourth of twenty-five children, her family was of a middling class. At 6 she had a mystical experience; at 7 she consecrated her virginity to Christ; at 16 she received the habit of a Dominican tertiary and then withdrew to a cell-like room in her family home for a prolonged period of intense mystical activity. She emerged after three years, committed to a religious life in the world. It was a brief life, but it took her into conversation and concert with princes and the popes of Avignon and Italy. Like the beguine movement, the tertiaries were a natural development, hard to date and hard to fully account for in their sudden explosion. Certainly the Franciscan movement had awakened a hunger in many for a return to the apostolic ideal of Scripture. More secure than the beguines, because they had the religious protection of the orders to which they were attached, tertiaries organized in several ways. While some tertiaries merely supported local friaries, others viewed their status as tertiary as a vocation in itself. In the late thirteenth century the ranks of the fully committed tertiaries split. Some remained seculars, like Catherine of Siena, living in the world, while others moved toward community and rule. One more major vocation existed: that of the anchoress. The anchoress was a solitary who, having made the decision to live alone, took vows and was forever bound to her cell. Free of rule, she was literally enclosed, most often in a room or little house attached to a church. Common throughout the period from 1100 to 1500, anchoresses were found next to village churches, town chapels, cathedrals in episcopal sees, or guild churches in commercial cities. If the nun and the hermitess in their peak periods represent vocations of withdrawal in a rural society, and the beguine and the tertiary represent religious service in a more urban world, the anchoress represents a thread that ties them together. The anchoress practiced total withdrawal and great asceticism, yet she was as at home in the cities of Europe as her forebears had been in the deserts of antiquity. Wherever enclosed, in whatever century, anchoresses held the vocation of deepest religious commitment. Many women became anchoresses who had been nuns, beguines, or tertiaries. Others became anchoresses direct from lay life, accepting and persevering in this remarkable challenge for thirty, forty, even fifty years. The house in which Christina of Markyate lived with Alfwen was probably a single room, abutting the north side of the church, with access to the outside world through three windows: one for light, one into the church for receiving Communion, and one to the outside to conduct such affairs with the world as were necessary. Hundreds of these cells dotted medieval England. Inhabited equally by men and women in the twelfth century, they came increasingly to be occupied by women in the thirteenth. At the same time many new cells were built to provide spaces for the growing number of women desiring an anchoritic life. By the thirteenth century English anchoritism had become a largely female vocation. Julian of Norwich lived as an anchoress in the turbulent fourteenth century. Julian lived in a cell attached to St. Julian’s Church in Norwich, England. From her anchorhold she wrote The Revelations of Divine Love, the first English book known to be written by a woman. Despite the array of nuns, hermitesses, beguines, tertiaries, and anchoresses, there were still those who eschewed all formal vocations, remaining independent religious persons. Religious life for women in the Middle Ages was more complex than is usually imagined. 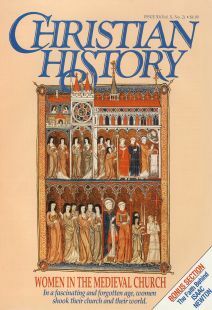 The nuns and hermitesses of the eleventh and twelfth centuries; the anchoresses of the twelfth and thirteenth; the beguines and tertiaries of the thirteenth and fourteenth; the Observant nuns of the fifteenth—all were in the forefront of the religious moods of their days. Not all were Hildegards or Christinas or Catherines commanding popes and remonstrating kings and emperors. But they had a strong sense of identity and purpose and an absolute certainty of the rightness of their relationship with their Savior. To them the nunnery was indeed an earthly paradise. Dr. Ann K. Warren is Adjunct Associate Proffessor of History at Case Western Reserve University and author of Anchorites and Their Patrons in Medieval England (California, 1985).